Fellas, this is the closest you’ll come to thinking like a woman, so listen up. There’s a message from the airlines: ”We don’t like weight!” Particularly on international flights. If you are flying to a single destination, in a warm climate for just a couple of weeks, packing should not be a challenge. However, if you’re covering multiple destinations with varying climates, some cool (c’mon smartie … temperature-wise cool), you need to think about the gear you can afford to take. Excess baggage costs are extraordinarily, outrageously high so don’t find yourself at check-in with an overweight bag. Maybe you can swap contents into your fellow traveller’s bags (quite an ask) or into your carry-on bags (but perhaps you have already maxed them out!). The first decision is whether you like your bags soft or hard. Personally, I like mine soft and expandable, just in case there are additional purchases to carry, so hard is out of the question for me. Do your research and select a size and one with useful facilities. Zippered external pockets, meshed carrying areas inside etc. was my choice. Whatever you think you want, do your research and check reviews; bags that may be prone to bursting open can be expensive, embarrassing and very inconvenient. You can also help by not packing them to ’sit-on-to-close status’, ‘cause that’s just asking for a burst which never occurs at a convenient time! Locks are to keep honest people out or let airline security in. Your choice, but TSA locks are a good idea, key locked or combo. If choosing a combo, do remember the combination, ”its best that way” he said, speaking from experience!. Consider yourself fortunate if you’re travelling in other than economy class. Economy class fares on most airlines these days have limits of 20-25 kgs for checked baggage and around 6-10 kgs for carry-on baggage, with size restrictions. My carry-on bag these days is a backpack; convenient in terminals, useful at my destination on the back or carried, handy, versatile. You really must check the baggage allowance that comes with your fare, they vary, and the situation just last month when your best mate went where you’re going, could have changed: CHECK FOR YOURSELF! Different fare types can have different allowances. Also let’s be goodie-goodie-two-shoes and label all our bags … life is soooooooooo much easier if they’re ever mislaid, believe me. A photo of your luggage may also help. Whilst dimensions don’t usually matter for check-in baggage if you are doing extended driving from your flight destination, consider what size bags or suitcases will fit in your vehicle so they cannot be seen; ours are 700mm (incl wheels) x 440mm x 290mm (not expanded) enabling two to fit side-by side, out of sight, into small European hatchback/sedan. Nothing like exposed bags in the car to scream ‘rob me!’. Packing your check-in luggage with your favourite jacket and those great, but heavy shoes you just love wearing and a few books you’re hoping to read, will just not cut it. Reading material = eBooks wherever possible or take one book and plan to swap books along the way! Plenty of swap opportunities are available in many accommodation options from small B&B’s to international class hotels. Think about colours, avoid clothing colours that easily show the dirt e.g. don’t take light coloured tees or shirts to Italy; you are going to get pasta sauce on them! Unless you really need the puffer jacket, take something else that is water and wind proof should you require. Personally, my old Goretex is always on my list; something that’s lightweight, packs to a very small size for backpack, carry-on or in check-in baggage is the way to go. If you need to take a heavier jacket, don’t pack it, wear it or carry it on board. Similarly, wear your heaviest shoes or boots, you can always take them off in the plane. I would also suggest you do some research on DVT and think about some compression socks for your flights. Depending on where you’re off to, consider flexible clothing. For Asian destinations I have some zip-on leg trousers, shorts by day, long trousers by night; a little more dressy and great should there be mozzies about! I am roll-up-man; everything I pack is rolled up and placed in the suitcase such that I am not sorting through and untidying layers of clothes every time I look for something. Rolling can also keep trousers and shirts from making you look like a rumpled hobo. Think about the fabric you are packing unless hobo-chic is your desire. Those of us who insist on wearing crisp linen just have to suffer, or take a travel iron. There are various flexible zipper bags (packing cubes) you can buy which I use for socks and jocks; again, easy to find in your luggage. Jan and I always carry a dirty clothes basket – that’s not a literal translation – a bag with a top tie in which we place all things that need to be laundered. OK you can call it a ‘laundry bag’. So, the prudently used packing cubes (clean) and the laundry bag (dirty) should eliminate the sniff test for cleanliness; our partners will applaud that. I reckon toiletry bags are a packing must, unless you like rummaging through your main luggage for tooth paste. My toiletry bag duplicates my usual bathroom kit, a hangover from business travel at short notice. If, like me you always forget something, keep your toiletry bag stocked with a second toothbrush, razor, spare razor blades, nail clippers, toothpaste etc. I also carry my trusty pocket knife with my toiletries (always placed within checked in luggage of course). Just imagine not being able to get a stone out of a horse’s hoof if you had to! So guys, buy a toiletries bag, pack it, put it in the cupboard and whether it’s an overnight stay or 3 months travelling you will know everything you need is there and available at short notice i.e. when other things are on your mind. You must put the toiletries bag in check-in luggage; it contains pointy and sharp things that will be confiscated if is in your carry-on bag! Also, make sure you are familiar with and comply with ‘carry on liquid’ allowances or you risk losing your favourite after shave at the security check point. Time to relax at your destination – cheers! Confession time. Most of these things I have learnt from the ever-practical Jan and they are useful guides. Do you have any packing horror stories, feel free to include those people you travelled with who really messed up packing? What did you forget? What hints or tips do you have? I must confess I think my husband packs better than I do, but I will still get him to read your fabulous blog post. I think there are hints for all of us. Happy travels and thanks so much for stopping by my blog this week. I think many men pack much leaner than women because in general their wardrobes are simpler than ours. But it doesn’t matter what the travels are it is always good to have a plan and stick to it. Thanks for visiting Retiring not Shy! Great tips! My husband is a big fan of the rolled packing style. My first big overseas trip I packed WAY too much and regretted it as I was so stressed with fitting in anything else I bought while away. Now I try to be as minimalistic as possible, but still have ways to go. Travelling overseas has enough stress associated with it without packing or baggage concerns Jess. Your man sound like a keeper to me 🙂 – and I’m betting he’s nice enough to lend you some space if you really needed! Great advice- I took packing cubes to China I could fit so much in – compressed and neat. My husband didn’t believe his eyes. Thank you Trish. Packing cubes are whiz-bang. I think you ladies might have a few more bits to carry in them, but they’re a great organiser. Ooh I’m going to share this with my boyfriend. We’re about to pack to go to Sydney. Although, to be fair, I’m usually the one with packing dilemmas more than him. I always end up with so much stuff and he condenses everything down to an overnight bag. Share away Kat, thanks. The overnight bag at the right size also means you are not waiting at the baggage carousel! I am a roll up gal too. I discovered it a few years back and am AMAZED at how everything fits in when you do it. Obviously I’m biased Lydia, but it’s just easier! “Do remember the combination”. LOL. You want to know how bizarre that is Leanne? With the myriads of passwords for everything these days, the minimum is usually four numbers/letters. Three I just don’t seem to be able to remember … and I might just have done it again DOH! https://uploads.disquscdn.com/images/aa0400d2896290cbb441a431055bd77b411773c1beb241a69508c03e101869c6.jpg Good choice (subconscious perhaps?) to leave ’em behind I reckon Janet, and of course it would have been soooooo expensive to get others in Bali if your man had to! 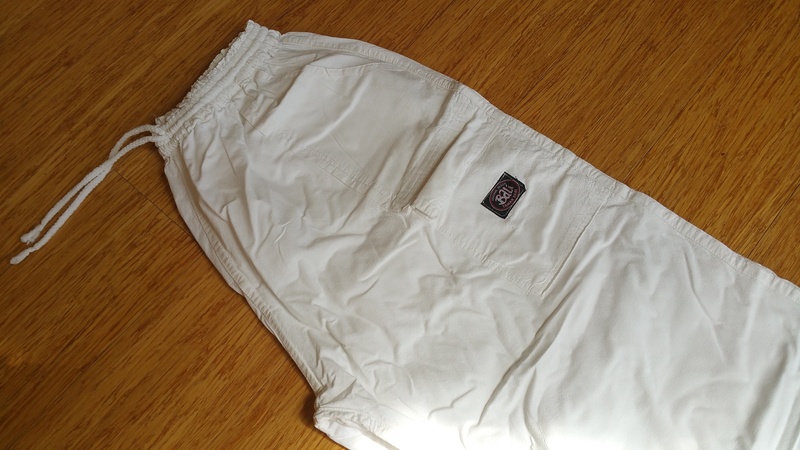 I would suggest a pair of light Bali cotton longs not a bad bet however, particularly if mozzies are about. Yea #TeamLovinLife! Three flights up marble steps in Lucca was challenging but “educational” for me about what I pack. I think for anyone, the mix and match thing is also important; by packing sets of matching clothes you don’t feel you’re wearing the same outfit all the time,or needing to wear a completely different outfit everyday. Now there’s a bit of vanity, are the neighbours going to gossip because I have worn the same clothes three days running in my overseas location? Probably not, but having a bit of a daily change makes ME feel better. These are very valuable tips, not just for the blokes, but for us women too. I will be showing this to my husband. I purchased some of those packing cubes and I’m dying to try them out. It will be handy for keeping everything together rather than rummaging through my suitcase for underwear and socks. I’m not convinced about the rolling method but I should give it a try! I’m also a backpack person for carry on bag as they keep your hands free. As I would expect Kathy, thanks, you’re well on the way! I trust you noted the mesh sided packing cubes, which often come in packs of 3, 4, 5?, so one look and you see exactly what you’re looking for. If you then wish to place the packing cubes in a drawer, what’s left in the bag is even more accessible, bingo! Great piece! I don’t travel much and am a slacker so probably a bit like a bloke when I travel. I try to take as little as possible to reduce weight as I hate having to stagger under heavy suitcases! well done rowen! thanks for any tips! … the rolling works well! happy 2017 to you both! every year we go to qld for about 6 wks! we’ve tried every conceivable formats with the number of bags, and the way we pack them! mr m always comes out the lightest! how does he do it??? we always take too much and each year we reduce it. decided to make it very easy this year! Thank you for your wishes for 2017 and comments Merilyn. You’ve obviously given travel packing quite some thought in the past, so I hope I might have snuck in something useful. It always amazes me with all the mixing and matching thought and care taken in packing, you get home and say “Why on earth did I take THAT?” I guess it always seems a good at the time!